Update: We reached out to LG and though it's still unclear when the actual product will launch, we can expect to see promotions starting this month. "With Google Cardboard, we wanted to create more immersive and delightful experiences for anyone on their mobile devices. We are excited about VR for G3, and the rich ecosystem of developers and manufacturers who are innovating with Google Cardboard and making VR more easily accessible." 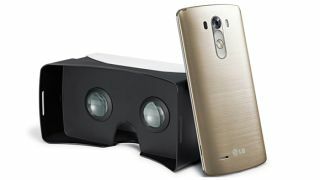 It's a Cardboard-inspired headset that turns the LG G3 into a virtual reality display, much like what Gear VR does for the Samsung Galaxy Note 4. The G3 slots into the VR headset and uses Google software to create a virtual reality environment, and it features a special "neodymium ring magnet" that uses the phone's gyroscope to let users control it without touching the display. The VR for G3 will launch in "selected markets" and come free with the LG G3, but it's not yet clear where it will be available or how much it will cost by itself.